Justin and I are going to have a baby! I am 15 weeks pregnant tomorrow. I had another doctors appointment today and everything went great. The heartbeat is so cool to hear. It was 163 beats per minute. The picture is from our sonogram at 10 weeks 4 days. The baby’s crown to rump length was 3.67 cm. The head is on the right side and the baby is looking down. 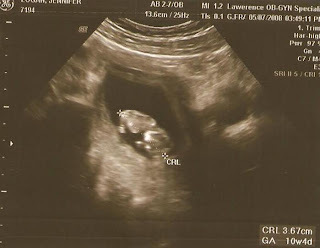 We should be able to find out the gender of the baby somewhere around my next appointment, which is July 2nd.